Come to Practice Stand up Paddle in Tarifa, Southernmost spot in Europe! 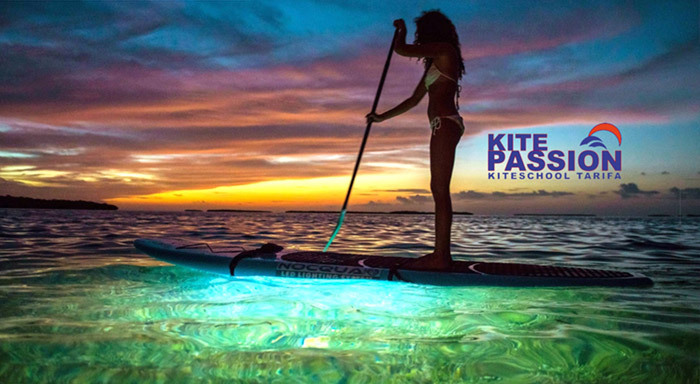 KitePassion Tarifa is a professional school dedicated to teaching paddle surf or SUP (Stand Up Paddle). We have a big team of professionals certified by IOSUP, International Organization Stand Up Paddle. Our main aim is that you learn how to enjoy this fantastic sport. Our method is based on the practice which means that you’ll be in the water from the very first moment, enjoying it 100%! We have SUP courses for all levels, from the beginners to the most advanced. During your SUP course in Tarifa, you’ll have the opportunity to experience various routes, for example, crossing the Punta Paloma island or paddle in Río Jara. Our school offers you the opportunity to learn this sport just in a few hours any day. We are always ready to SUP, regardless if there’s wind or not, whether it’s a wavy day or the sea is calm. Furthermore, we have the best SUP equipment. Depending on your needs and level we’ll provide you with a latest-generation Fanatic board, inflatable or a hard one. For more information visit our SUP and surf website www.surftarifaschool.com. Our best stand up paddle course in Tarifa includes insurance, instructor and all the equipment. Are you looking for an accommodation in Tarifa? Click here for info about our SUP lessons and accommodation packages. Very warm welcome, lots of info, friendly teachers and the normal price range, an absolute joy to take lessons here. I was travelling through Spain in December and while visiting Tarifa the surf picked up so I hired a board off Juan at KitePassion. He was very helpful and the price was reasonable. Gracias, I had a great time. Loved surfing in such a beautiful place with great people. Just fill in this form and we’ll contact you.